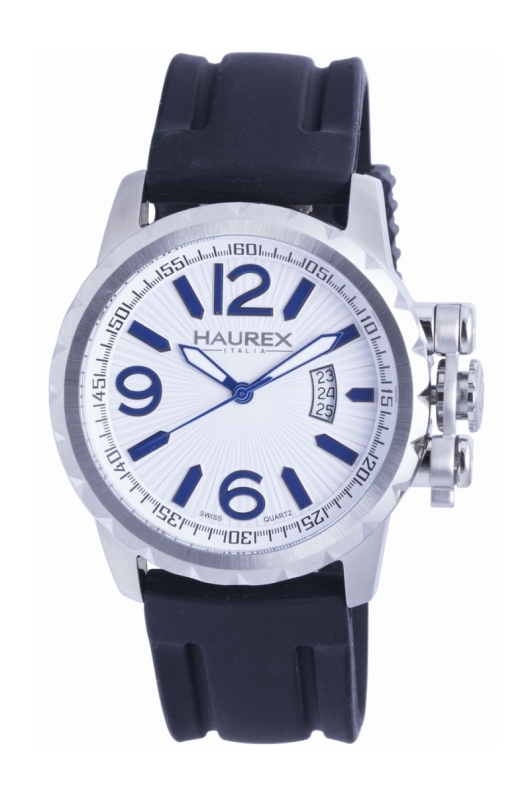 When you look across the Haurex line of watches you’ll find they all define the current fashion trends while also using the latest technology in materials. Haurex chose to locate in Italy, one of the capitals of fashion forward thinking and expression. They are serious about producing up to the minute watches and have set up their own design department to foster innovation. The Haurex Aeron 3A502UWN watch perfectly exemplifies Haurex’s strengths of building quality fashionable watches. In the last decade in particular, men’s watches have crept up in diameter to meet modern tastes. In a 46.5 mm stainless steel case, the Aeron 3A502UWN embraces this shift with a substantial sizing that’s hard to ignore on the wrist. A large crown protector hugs the crown to ensure this delicate piece doesn’t become broken or dislodged. The Aeron 3A502UWN is definitely a statement watch. The Aeron 3A502UWN is a three-handed time only watch. Because of the large case, there is a lot of space on the white sunburst dial to make the watch extremely legible. Big Arabic numerals in a stunning blue reside at 12 o’clock, 6 o’clock and 9 o’clock, while the rest of matching blue hour markers are in a pencil style. Lumed dagger hands and a blue seconds hand, which ticks off the seconds on the flange, complete the picture. The choice of blue against white is a great combination, bringing some color and attention to the dial. A large date aperture shows three days, the current date, past date and future date. Perfect for the hot and humid days of summer, the Haurex Aeron 3A502UWN comes on a black rubber band that secures with a buckle. The watch operates on a Swiss quartz movement and is water resistant to 165 feet. For a stylish and on-trend men’s watch that not only dresses up your wrist but also uses quality materials, the Haurex Aeron 3A502UWN is for you. If you’re looking for affordable sophistication, you’re off to the races with this fine timepiece. 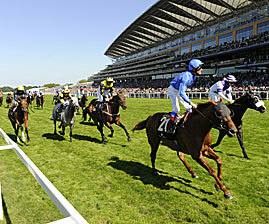 For over 300 years, the famous Ascot Racecourse has been the ultimate stage for the world’s best racehorses. Founded by Queen Anne and favored by the world’s social elite, Ascot has always been the centerpiece of the British social calendar. If you were attending one of Ascot’s legendary racing events, a Hanowa Ascot Rose Gold Black Dial watch on your wrist would be entirely appropriate. This spectacular timepiece features a beautiful rose gold PVD bezel, hands and hour markers. With a jet-black dial and matching rose gold inserts in the stainless steel bracelet, this sophisticated classic will ensure you look your very best at any occasion. 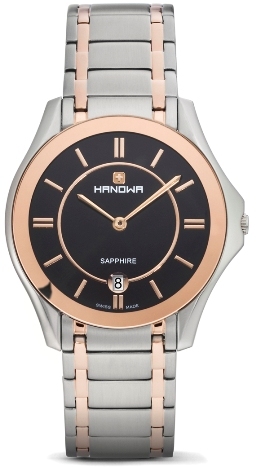 The Hanowa Ascot Rose Gold Black Dial has a sleek looking 35mm stainless steel case that is only 6mm thick. This elegant two-hand design has a convenient date window at 6 o’clock and features a scratch resistant, anti-reflective sapphire crystal. The watch is powered by a precision Swiss made quartz movement and is water resistant to 99 feet. Hanowa has developed an enviable reputation for producing high quality, reasonably prices timepieces. The company has always been very aware of emerging trends and has been able to quickly evolve, introducing attractive new styles that meet changing tastes. Now that fashion watches are popular again, timepieces like the Hanowa Ascot Rose Gold Black Dial are helping to meet the growing demand for glamor. The good thing is that you don’t have to go to Ascot to acquire one of these rose gold beauties. Just contact your authorized Hanowa dealer, mention that you’d like to purchase a Hanowa Ascot Rose Gold Black Dial and you’re off to the races. When you name something after the oldest and most prestigious tennis tournament in the world, it better be good. 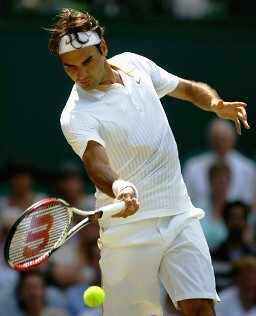 Wimbledon is the oldest and most prestigious tennis tournament in the world. It is the only major tournament still played on grass. For two weeks in June, royalty, celebrities, and the world’s tennis elite converge on the All England Lawn Tennis Club in London’s Wimbledon District to determine who is the best of the very best. 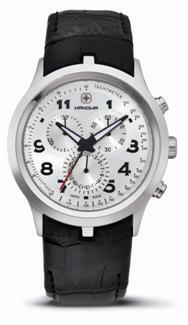 The Hanowa Wimbledon Silver Dial Chronograph would be right at home at this prestigious event. This classically styled chronograph exudes the understated luxury and elegance that Wimbledon is famous for. With its lustrous silver dial and polished 43mm stainless steel case, this precision timepiece has the sophisticated style that makes it appropriate for your dressiest occasions. With three easy to read subdials and a sweep second hand, the Hanowa Wimbledon Chronograph is ready to time virtually any event. This robust timepiece is powered by a precision Swiss made quartz movement and is water resistant to 330 feet. The watch is equipped with a durable mineral glass crystal and is fitted with a handsome 24mm black leather strap. Hanowa has been committed to bringing the world genuine Swiss quality at reasonable prices since 1963 and the precision and skill that goes into the production of these fine timepieces has not gone unnoticed. If you appreciate luxury, but don’t like paying the prices that many luxury watches command, a Hanowa Wimbledon Chronograph could easily be the perfect choice for you. Just mention Wimbledon to your authorized Hanowa dealer and they will be happy to serve you.